Come by anytime to meet our wonderful and experienced staff, see our recently remodeled classrooms, and learn about our P.L.A.N. curriculum. We invite anyone to join us (no appointment necessary!) between 9:30-11:30 am. 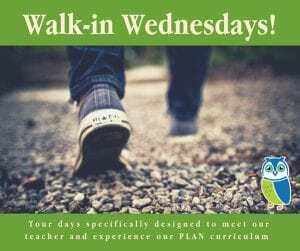 Walk-in Wednesday is your chance to see us in action! Copyright © 2018 Georgetown Hill Early School. All Rights Reserved.